Going back to our interesting "head and neck" webcam shots taken by Diana, another reader, Michael sent in a comparison shot of a bird perched on the top of the tree closest to the object. In the light of the suggestion that the picture is just a bird, I show that here with the original picture for comparison. The bird picture is first. The object is clearly bigger than the bird from an image point of view. Also, the bird is more squat and less pole like than the object which interests us. Where that leads us is largely in the eye of the beholder, but it is extra grist for the mill. The snow is gone (almost) and the sun is beginning to shine that bit longer. Loch Ness begins to beckon and so does its most famous inhabitant. 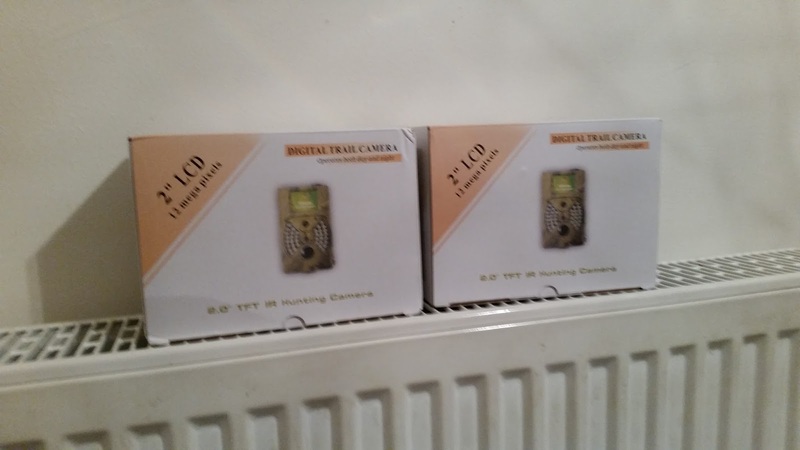 So, to get into monster hunting mode, that means thinking ahead and preparing for some more trips up north; looking out the camping equipment, binoculars, cameras, night vision equipment and so on. Also, to conform to the sceptics' monster hunter stereotype of somebody who is mentally challenged and socially dysfunctional; perhaps a bit of the wild eyed look, messed up hair and drooling would also be required. Then again, maybe not. As a quiz, can anyone remember where the quote "It's My Monster!" comes from? I am currently on the lookout for new equipment, but one item remains a staple of the modern monster hunter's diet and that is the game camera. As you can see from the picture above, I have purchased two more and intend to grow that as I plant them along the loch shore. These particular ones are cheaper cameras, mainly because I expect to get through a lot of them! However, I won't be sticking to one make and model because if a fault presents itself in one unit, it will probably present itself in all of them and eventually render the entire batch a rather short term investment. If you know these devices, you basically strap them around a tree facing the loch, switch them on and walk away. The proximity and infra-red sensors will do the work for you as they wait for something to move within their field of sensitivity. When that happens, they can be configured to take a quick succession of still pictures or video clips of varying duration, frame rate or resolution which are then stored on an SD memory card. The other consideration is battery life. If you place a camera at the loch and leave it for a number of months, you hope that it will run for most of that time to deliver the best opportunity of photos. Some cameras can work on eight batteries, some up to twelve and the battery type is also influential. Moreover, battery life can be reduced by the number of pictures or video clips taken. I have returned to cameras which have taken thousands of pictures triggered not by monsters, boats or birds, but just the continuous wave action below the camera or the fluttering of branches beside them. This makes the placement of the device of particular importance. But how effective are these devices in the hunt for the Loch Ness Monster? Let us do the maths on a typical device. Two parameters are important and these are the sensor sight angle and the sensing distance. These typically come out at 100 degrees and 20 metres and this forms an arc of detection on the loch in front of it. Note it is important to place the camera as close to the loch as you can lest the sensing distance is wasted over the land in front of it. So a bit of arc geometry gives us a maximum coverage of about 350 square metres. This is to be compared to the entire surface area of the loch which is 56,400,000 square metres. So our example camera's coverage of the loch is a mere 0.0006% of the loch surface! In fact, if we planted cameras side by side just outside each others arc of sensitivity along the entire perimeter of the loch, the total coverage of the loch would still only be about 3% of the loch. To put it another way, if the creature randomly surfaced once a day anywhere on the loch, the odds of it appearing in the arc of a single camera would be about 160,000 to 1 against. Note this does not take into account the shallowness of the loch near the camera. 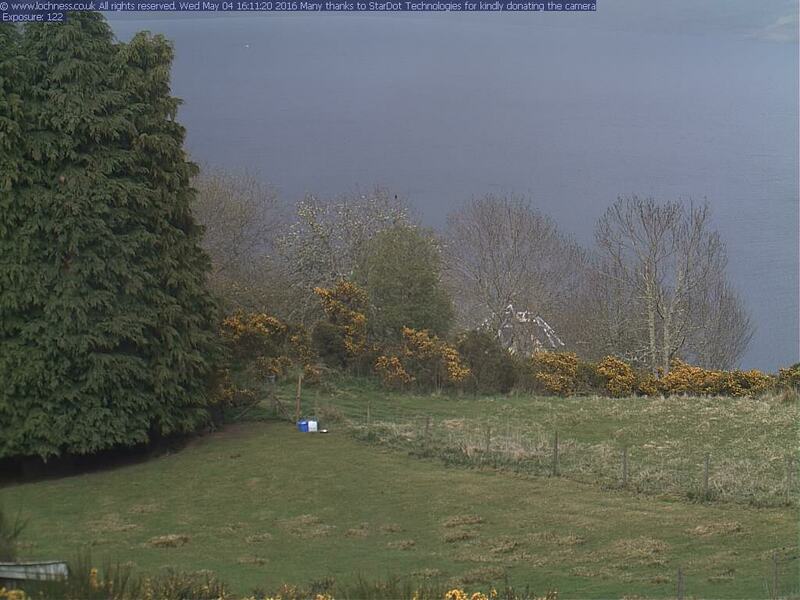 However, if you plant ten cameras around the loch, the odds "only" drop to 16,000 to 1 against! That would mean a wait of 16,000 days or 43 years to be in the zone of that single daily surfacing. A hundred cameras drops it to a mere 4.3 years but maintaining that amount of cameras becomes a team effort. Clearly, these are example stats since it is not known how many surfacings of the creatures(s) occur only a daily basis or whether they are more inclined to surface near the secluded areas I seek to plant these cameras by. But I hope these cursory statistics demonstrate the size of the task. So why bother? The motivation is the potential prize. As monster hunters are painfully aware, there are photos that are claimed as proof of the Loch Ness Monster, but next to none can really claim to be close up and detailed. But any large creature that comes within 20 metres of such a camera is going to give us an exceptional picture. Consider the photograph taken below with one such trap camera I recently retrieved from the loch. Look at the object in the centre bottom. Can you see the eye to the left and the open mouth? What could this be? Well, don't get too excited as it is only a rock, but I wanted you (through the illusion of simulacra) to get an idea of what kind of picture these cameras can get if a large creature surfaces near them. It is, of course, a long shot given the statistics just mentioned, but what has one got to lose? Consider Tim Dinsdale, who spent many hours, days and weeks at Loch Ness for twenty seven years and failed to get the game changing picture or film. Consider Ted Holiday, who spent many hours at the loch between 1962 and 1980, without a single photo to show for it (despite having four sightings). Other monster hunters were luckier, but they got nothing to the standard of our imagined photo above. The lesson for me is obvious. I don't intend to spend thousands of hours staring at the loch with camera and binoculars at my side. 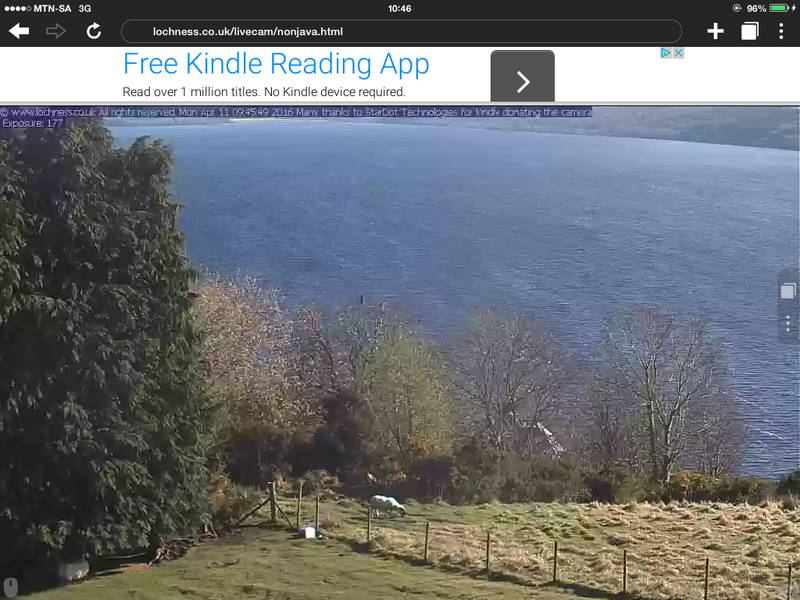 Call me lazy, but given the failure of previous Nessie men and women, one is just as well strapping these cameras around the loch and heading home to do more productive things (like watch football). That does not mean I discourage others from doing the good old fashioned stuff. Somebody may yet get lucky one day with that technique and produce that convincing footage and I will be as ecstatic as anyone else. But as you can see from the rain lashed night shot below, these cameras will stand in silent, uncomplaining solitude, immune to boredom, undistracted, watching and waiting for something to pass in front of them that may just change the way people look at this legend. For me, that may take years or it may never happen. One thing is for sure, if you do nothing, then nothing is certainly going to happen.